Jim and Emilie Zeibin, touring their Passive House with their extended family. We talk a lot about Passive House construction on our website, but we also want to share the story about how our Passive House came to be! Jim and Emilie Zeibin are the proud owners of the Cottonwood House, and their son, architect David Zeibin, is the technical designer behind the project. Emilie Zeibin put together this short essay to describe why she and Jim decided on a Passive House for their new home. As Jim made his plans to retire from a career as a chemical engineer, he decided his first project was to build us a house. Having spent his career in the oil industry, Jim was very conscious of how much energy society uses and how we need to find other energy sources. His desire was to build a house that was superbly energy efficient, to reduce the energy we would use. Jim has been known to say, “The best way to save energy is to not consume it in the first place.” Working in the oil industry meant that we moved around a lot. Jim was tired of living in houses that leaked, had cold windows and were expensive to heat. 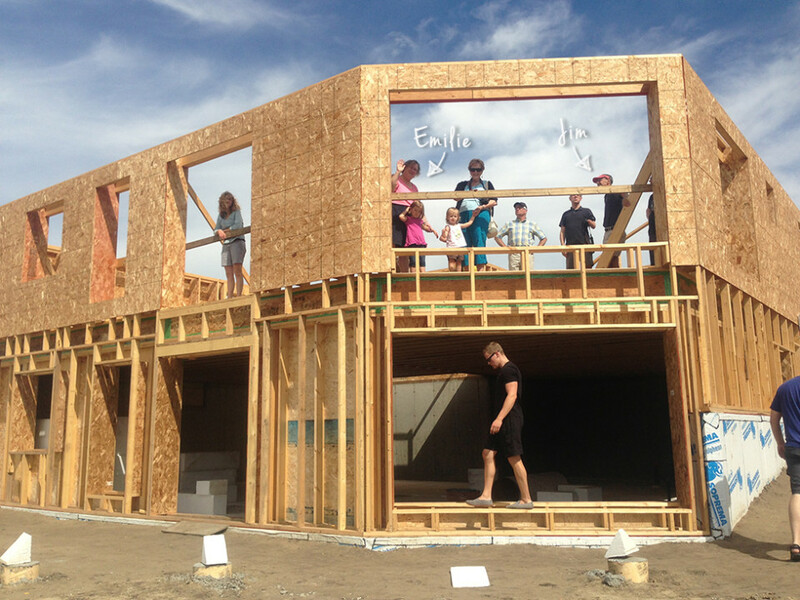 Jim started following the build of the Net-Zero houses in Edmonton, mainly the Mill Creek Net-Zero house. After some consideration he felt that the extra cost was more than we should personally spend at this point. Then our son David suggested that Jim look at the “Passive House” method. They discovered a website describing this style being built in New Brunswick by Tim Naugler. After also studying the International Passive House website, Jim became convinced that the “Passive House” style of construction would have significantly lower energy consumption and the costs might be more manageable for us. He compared it to taking the R-2000 construction of the 80’s to the extreme. The opportunity came up to take a week-long course in Vancouver to learn this method. After Jim and David attended, Jim thought this might be a more plausible choice for us. So plans were begun. We started searching for a lot where the back of the house would face generally south since that side would be designed as the main living area. It would have extra large windows from Europe which are made to give heat gain rather than heat loss. They would passively collect the heat of the sun to heat the house, so we also would need to have enough space behind the house so the sun would not be blocked. Once we purchased the lot, our son, the architect, began the design process. What astonished me about the design and the construction was the thickness of the walls. We have 12 inches of expanded polystyrene (EPS) underneath and around both sides of the footings and the frost wall as well as 16 inches of Roxul® insulation inside the wood walls. The walls are 16” thick plus a service cavity of another 3.5”. High R-values in the insulation (R-76 in the walls and R-94 in the ceiling) are another significant part of Passive House. I’ve never seen the construction of a regular house foundation before, but I was quite amazed at the complexity of this foundation with all its layers. I’ve also been surprised by the attention to detail needed in taping every possible hole where air can enter. This house must be airtight. Already familiar with this method, Jim has been more surprised by how long this process is taking. Since this method is fairly new in Canada, it took a bit to find people in the trades willing to try something unconventional. It seems that a lot of the trades are hard to reach and even harder to get a quote from for something this unusual. In near desperation, Jim contacted Peter Amerongen of Habitat Studios for assistance. As it turns out, the trades that had been working with Peter Amerongen on his highly efficient houses (some of them Net-Zero), have been open to our project. Since Jim prefers hands-on building over project management, he also found Eric Del Brocco to help find the trades needed. The cost of materials and labour is higher than a regular house. Jim somewhat expected this, but the extra complexity makes labour and materials even more expensive. We estimate the cost to be about 20% higher. Another cost will be a heat recovery ventilator which will give us healthy air exchange that is needed in such an airtight house. We feel this extra cost will be worth it in the long run, when heating our house is drastically reduced. Comfort is one of the main objectives for this build. In the cold country of Canada this method just makes sense to us and we’d like to recommend this energy efficient construction method to others. There is going to be a major humidity problem in this house; I don’t see anything about addressing this aspect. Hi Gord. We haven’t got into too many of the technical details on the site yet, but rest assured that Passive Houses sometimes have the opposite problem in cold climates. I’ve added an entry to our FAQ to answer your question. Thanks for the question! I’m interested to find out more about the type of kitchen and bathroom ventilation that is used in a passive house. I read the FAQ section of this website and it indicated there are specific HRV sensors in these types of rooms to boost the air exchange rate but it doesn’t clearly say how it works on a per room basis or if it boosts the HRV air exchange for the whole house. Usually kitchen and bath ventilation units are directly vented to the outdoors and remove odors and humidity in those locations as they occur. Can you provide how this is dealt with in a passive house? Hi Allan. Thanks for your question. We don’t yet have the HRV and ventilation system installed, but our understanding is that it boosts the rate for the whole system — effectively increasing the airflow rate from the 60-80%-capacity regular speed up to 100% (or some other predetermined speed) temporarily. – Bathrooms: Exhaust air is vented directly to the HRV for heat recovery. The incoming/outgoing airflows are separate so there is no chance for odours to migrate back into the supply air (assuming you’ve allowed minimum 6′ between the intake and exhaust vents on the outside of the house). – Kitchen: A recirculating range hood with charcoal filter is used to clean moist/oily air at the source. This recirc hood dumps the “clean” air back into the kitchen where a return-air vent picks up the air and sends it through the HRV for heat recovery. This vent is generally sized for the largest airflow volume in the house. – Laundry: A common solution is a condensing dryer, which does not require a vent. Very good post about your passive house .I’m from the east coast of canada in new brunswick and like you I have researched lots of information about the passive super insulated house design I drew up my own design and then had an engineer approve my drawings and add a few things I didn’t think of like the added eps insulation under my heated concrete slab .my house design is a ranch style house also with roxul insulation.I installed 5.5 inched of blue board styro foam insulation in my interior double wall system with an r value of 27.5 then I have a 4 inch insulated service cavity for my electrical and plumbing with roxul insulation again of about an r value of r18 then my outside wall is 3.5 inch thick again with roxul insulation of about r13.6 .then exterior plywood sheathing.on the outside of this I put 2 inch eps rigid insulation of about r8 value then I put 4 inch of roxul insulation of about r value of r18 over the eps then strapped the roxul for my siding application so I should have about r85 in my walls .the reason I put the exterior insulation was to assure a thermal bridge from the exterior to interior of the house also the sm blue board on the interior creates my vapour seal to make the house more airtight.I’m also going with a full solar system so I’m basically off grid .that cost is about 26.000 but no energy cost to pay every month .I feel spend it now rather that pay utilities forever lol .I will also be installing a hrv system to heat our house as well as give us good air quality .our ceiling insulation we be almost r100 again roxul insulation and under our heated concrete slab our insulation is about R40 .this is our retirement house all built without a mortgage .our hot water system for infloor is propane with a wood boiler backup .our domestic hot water is also propane on demand.to keep our house effeciant.